Synopsis: In the story, Leroy "Horsemouth" Wallace, who has been a drummer in reggae bands, decides to try and give his fellow musicians an even break by becoming a record distributor. When local gangsters rip him off and stop his budding music venture cold, his fellow musicians decide to rob the robbers. Practically everyone in this film, beginning with its star, were reggae musicians who were well known in Jamaica. Review: This is one of those films that you don't ever really hear about but when you run across it and get a chance to watch it you wonder why the hell you never saw this film before. I have to say that the overall plot is kinda thin but in no way does that take from the film. The main character played by Leroy"Horsemouth"Wallace is very likable and you can feel his struggle as he tries to make it by and eventually gets shut down by an organized crime group ,but that doesn't stop him from getting his revenge. 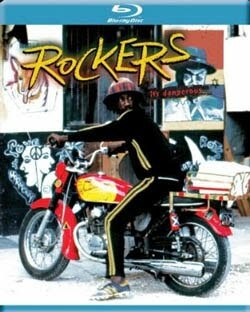 Along with a very likable character you get some great reggae music all the way through this film and it really helps to get you into the story and atmosphere of the film. Now I have not seen this on any other format so I can't really compare the quality of the picture to any other format but I can say that this film looks stunning on Blu-Ray and has been cleaned up very well. The only downside to this Blu-Ray is that there are no special features. Overall this is a great film with a great soundtrack and I highly recommend this film!